The fact that this is all being promoted under the guise that it is to cut down on Scratchiti is a little perplexing. By Jennifer 8. Lee Via The New York Times City Room. The Metropolitan Transportation Authority continues to find new ways to rent its subway real estate to advertisers. Joining the tunnels, station stairs, columns, subway insides, subway outsides, station turnstiles: subway windows. 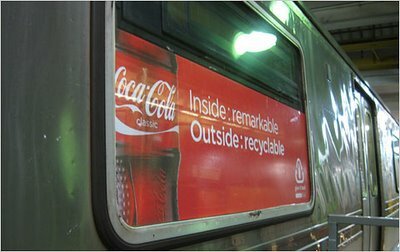 As Gothamist pointed out last week, red Coca-Cola ads are now covering a number of subway windows, as part of a 30-day pilot program. They are being used on a single eight-car A train where four of the cars have ads covering their large windows (though not their door panes). None of the windows on the other four cars are covered. Despite the M.T.A. budget shortfall, transit officials say that advertising revenue is not the main motivation for the program. Instead, the sprawling ads have a practical purpose. The first is to reduce what officials call “scratchiti,” or scratched graffiti on the windows. Scratchiti has become more popular over the past decade as more cleaning agents were developed to fight traditional graffiti. Scrachitti is a major vandalism problem in the subways, costing the system more than $2.5 million a year to replace the glass and covering it with protective Mylar. One man was arrested last month for scratchitti after he was caught in the act by a cameraphone. Paul J. Fleuranges, a spokesman for New York City Transit, said the agency hoped that the film, called Scotchcal, would cut down on the frequency of scratchitti. The vinyl graphic film, made by 3M, is widely used to wrap buses, because a it allows a full image to be printed on the outside, while the little perforated holes allows people (in theory) to look outside. The other benefit transit officials are hoping for is that the film will save on energy costs, as the covered windows reduce the amount of hot sun that enters subway cars. “The car equipment people have for a long time sought to use tinted windows in an attempt to cut down on that ’sun soak’ effect; just like tinted windows reduce the warmth of the sun on a passenger vehicle and help keep the car cooler and assist in the A.C. cooling the car more efficiently,” Mr. Fleuranges wrote in an e-mail message. Of course, this aspect of the pilot, given that it is December, will be harder to test. Mr. Fleuranges said the pilot program is actually free to the M.T.A., because Coca-Cola paid for the ads, and CBS Outdoor, which handles subway advertising, threw in the labor. And because you can see out of the windows but not necessarily into the car, a number of people have pointed out the potential security hazards. It seems like a fertile place to get mugged if you are the only one in a subway car late at night. How will the police know to rescue you? Mr. Fleuranges said that the Police Department’s transit bureau had been involved in pre-pilot discussions and had viewed the material after it was applied. An e-mail message to the Police Department on the topic has not yet been returned.